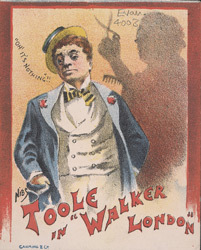 This leaflet featuring a portrait of J. L. Tool eis advertising a production entitled 'Walker in London'. J. L. Toole was one of the great comedians of the Music Hall and was an enthusiastic actor in legitimate theatre throwing himself into every role. He started acting with an amateur society called ‘The City Histrionic Club’ and had his first professional appearance at the St James’ Theatre in London. He made detailed studies of human emotions on which he based his characters, he was a very funny man and his timing was always perfect. 1893 was the last year that he was seen on stage, after this date he published his memoirs and retired to Brighton.